⊕ I think my favorite detail about this map is the little splotch that is the Smoky Mountains on the western edge of North Carolina. Having spent a good amount of time there they really do have a different climate than the surrounding area. The other day my girlfriend and I were talking about places we would like to live after grad school and one of the things that got brought up was how ‘seasonal’ the location is. She grew up in Long Beach, California, which essentially has no seasons, whereas I grew up near Ann Arbor, Michigan which very much has seasons. 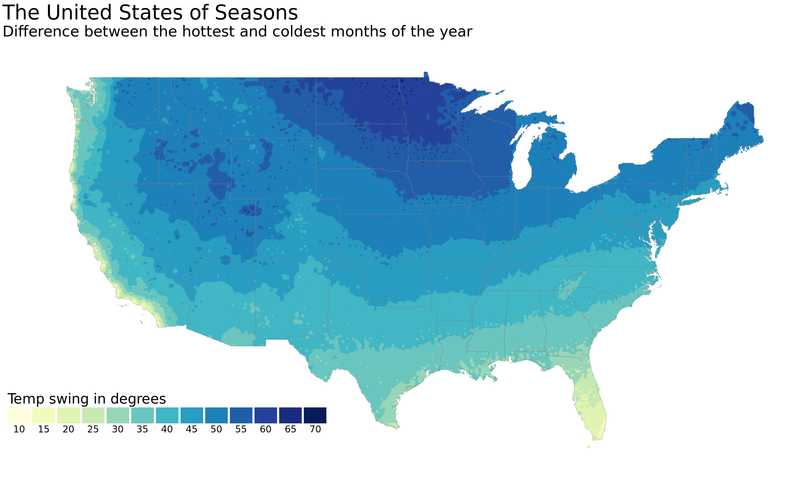 This got me to thinking: what does the country look like in the context of its seasonality? By ‘seasonality’ we mean how big of a shift in the weather is there during the year. Being into data and maps I figured I would try and investigate this in a data-driven way. The final result is above this, but here I will walk you through the process that got me from question to map. The data that I wanted were the average (high) temperature over the year by different locations around the US. ⊕ Turns out there are some nice APIs for getting this such as Wunderground’s but they all ended up requiring me to pay if I wanted to get anything close to the level of detail I wanted. Luckily, we have a federal government agency that likes to track things related to climate/weather in the National Oceanic and Atmospheric Administration (NOAA) and they have oodles of data. After some digging I discovered what I was looking for: U.S. Climate Normals, a dataset for ~7,000 stations around the country that contains ‘normal’ or average measures of temperature, wind, etc for the dates from 1981-2010. Looking in their “https” datasource they had a nice readme.txt. After skimming this document I found that what I was looking for was in products/auxiliary/station, there was a problem though. It is briefly alluded to by the line in the readme corresponding to these files: Users wanting to visually inspect normals for just one or a few stations should use the files in this subdirectory. “Visually inspect”? I don’t want that I want to read it in R! Let’s see what the problem could be…. Turns out these files are just a bunch of tables concatinated into a single text file. Not exactly able to be read by read_csv. All I want though is that top line: mly-tmax-normal.... So we can go old school and read the file line by line and extract just that line. This function will take a given station ID, download the text file corresponding to that station, and extract the monthly temperatures into a nice clean dataframe. Let’s test it out on the station we looked at two seconds ago. ⊕ The weird letters in the temp columns correspond to the quality of the measurement. Some stations hadn’t been up for all the years so their averages were not as exact. We ignore this here but in a more rigerous analysis we should probably look into them a bit more. Wonderful! Now all we need is a list of the unique station ids and we’re good to go! Luckily that is in the data as well. station-inventories/allstations.txt contained all the info on each station along with the geographic position of the station. Let’s grab it so we can get scraping! Now we just need to loop through all the ids and amass a nice dataset of their temperatures over the year. We are going to do this in a loop rather than something like purrr::map_df because we can more easily handle errors and log progress. This loop takes a long time to run. With each query taking ~1-2 seconds and there being ~7,000 unique stations. I let it sit overnight. ⊕ Amazingly not a single station failed to download. When dealing with long running scripts like this hitting things on the internet that is practically unheard of. So we want a measure of seasonality. We will define this as how big of a delta there is between the warmest and coldest months for each station. We’re basically done now! Let’s just plot this and call it a day… Unfortnuately it doesn’t work that easily. Let’s see why. Unsurprisingly, our data are unevenly distributed around the country, we want a nice smooth plot of the swing so we need to do some interpolation. 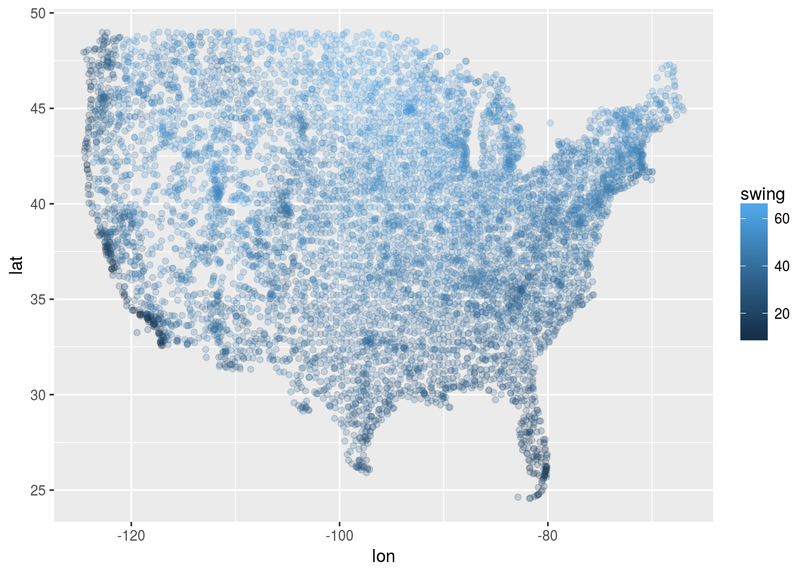 Enter the geospatial side of R.
What we need to do is fit a model that can predict average swing given a lat-lon pair, along with generating a high-density evenly-spaced grid to run that model on. To get the grid we will download a US shapefile from the Census’ Tiger repository and use the library rgdal to read it in and exclude the given locations we don’t want to look at. 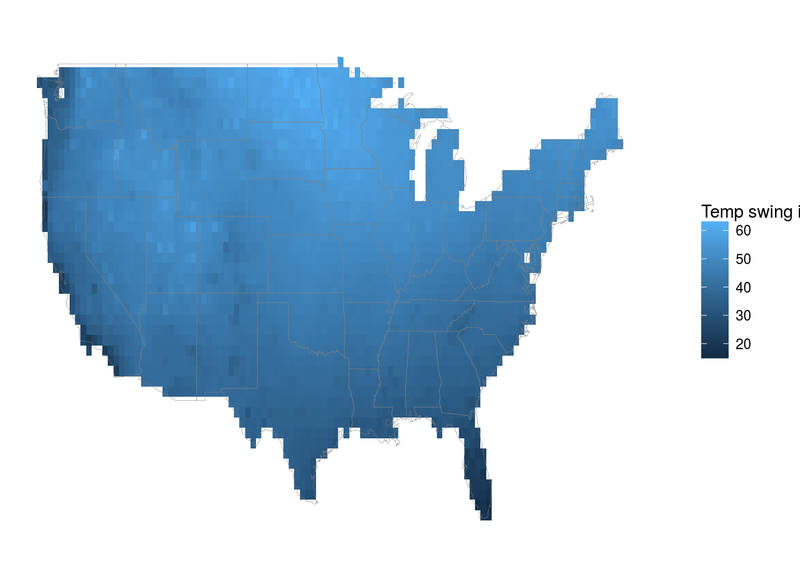 ## Source: "../../static/seasons/us_shapefile/", layer: "cb_2016_us_state_500k"
Looks right to me! 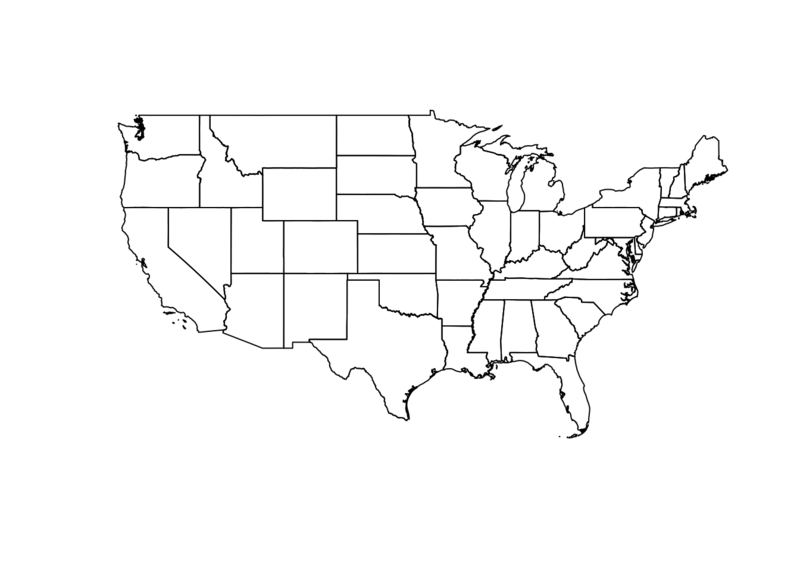 Now let’s calculate a grid of points over this.
.[us,] # subset the grid such that it only has points that fall inside of our states. Next we need to fit a model for interpolation. Here I use one of the most common techniques for this: inverse distance weighting. ⊕ The task of fitting a model to these data is actually a fascinating one that I am not giving nearly enough weight in this post. Here we are just having as inputs lat and lon but we could easily make it more realistic by adding in elevation etc. Some models use 2-d gaussian processes to fit flexible models, some use splines, it’s a vast world and one I would love to dig into more! # convert the data to a spacial dataframe. # make sure that the projection matches the grid we've built. We’re in business! 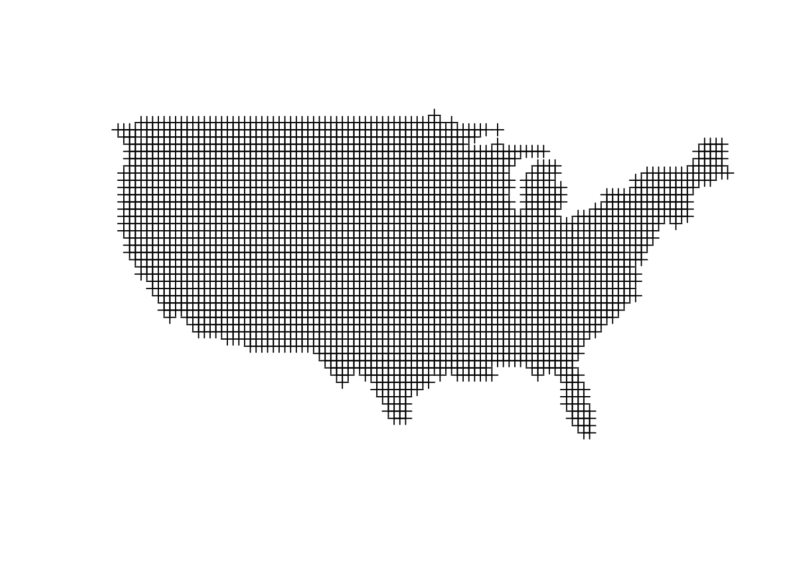 We’ve now got an evenly spaced grid of points we can plot in a standard raster way! Looks good but could use some improvement. The gradiations are rather smooth and thus it’s hard to see. Let’s bin the swings to 5 degree intervals and change the color pallet to be a bit more appropriate. ⊕ I chose 5 degree intervals here because I figured that was about the limit of sensitivity for the average person. Totally arbitrary though. There it is! In the top plot I have rerun the grid with a much higher n and also tweaked some settings in the legend/scales to make the plot look a bit better. Hopefully now when you have some interesting geospatial data that is not evenly distributed you will know how to deal with it!